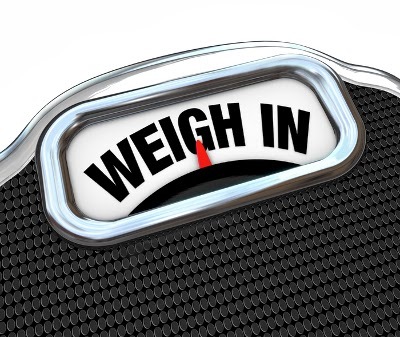 Today was my weigh in day for Weight Watchers. 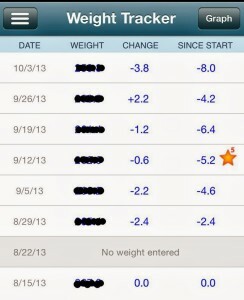 It’s been 7 weeks and I’ve lost a total of 8 pounds. 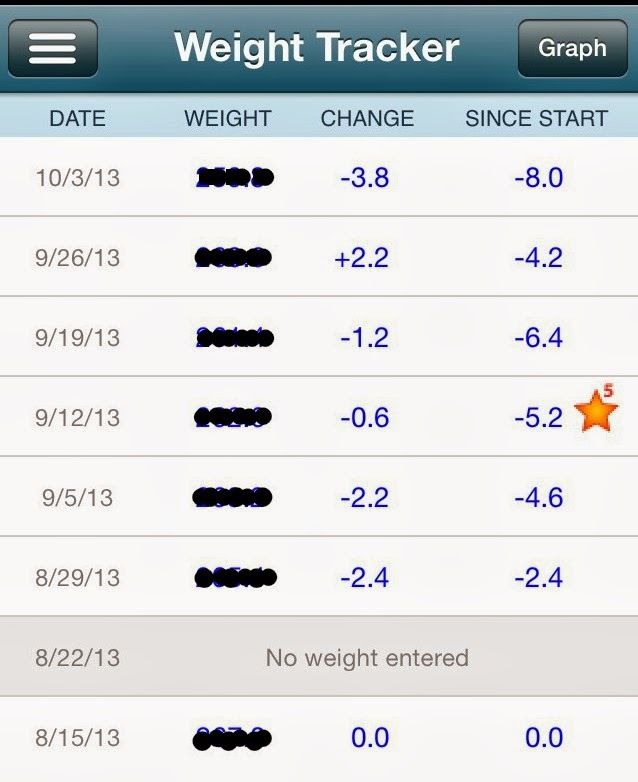 This week alone I hit -3.8. Week 6 was the week of my 45th birthday. Although I didn’t celebrate with a birthday cake, I did get lazy with tracking what I was eating. I learned that I need to track. So back on track I got and did much better on week 7. I won’t be able to weigh in next week as I’ll be traveling for work. I’ll also be taking a mini cruise to the Bahamas (next Friday to Monday). I originally was only planning on working out a couple of times while at my conference and skipping out on the ship but those plans changed for the better yesterday. I work from home and have two co-workers who also work from home, one in Nebraska and one in Oklahoma. We try and work out together via video chat (either oovoo or facetime) from my iPad. Next week, my co-worker from Nebraska will be staying in the same hotel room with me – so I have a feeling she’ll be dragging me to the gym more often than I planned on going. Which is a good thing, right? I picked up some granola bars, they were buy one get one free, to pack in my suitcase and carry-on. I also plan on bringing some sliced cucumbers with little cups of hummus to eat on the plane. I’m staying at an Embassy Suites and they offer a free breakfast that includes oatmeal. My plan is to eat a cup of oatmeal with a piece of fruit for breakfast each morning. Locate a place with a good salad as an option for lunch and then enjoy my dinners out with my friends/co-workers but still keep my points in check. Anyone have any good travel tips to share? I also wanted to talk a little bit this week about the topic we discussed at our Weight Watcher’s meeting – The How-Tos of Habits. Habits are so hard to change but are very important to a successful weight loss. There’s an old saying that says if you stick with something for 21 days (or 3 weeks) then you’ll create a new habit. I can tell you that I have tried doing something for 3 weeks and by week 4 I still struggle with it as a habit. I was not surprised to hear today that some habits take 18 to 254 days to actually make a behavior automatic. That seemed so much more realistic to me. Although I’d love for it to only take 3 weeks. I realized that I’ve been creating habits since I was married, 25 years ago, that won’t take just 3 weeks to change. Although I’m in it for the long haul and prepared to stick with it as long as it takes – even if it is 254 days. So many times we make such large goals that they become something overwhelming. It’s so easy to get discouraged if you set your goal so high. That’s why Weight Watchers has you start out with hitting small weight goals like 5%, 10%, etc. for your weight loss. This month their routine to work on is “what’s for lunch”. Instead of having you plan out your whole day in advance (which still isn’t a bad idea) they break it down into a small doable goal. One of my goals I’ve set for myself this past month was to eat breakfast. Most of the time I make myself a smoothie with a vegetable such as kale or spinach as one of the main ingredients. Part of keeping me on track with that “routine” was making sure I had fresh fruit and vegetables on hand. It’ll be interesting to see how my habits/routines change while traveling this month. What healthy behavior would you like to adopt? What will you change this week to help you create that new habit?